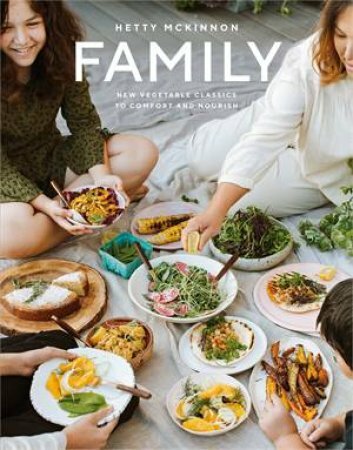 In Family, bestselling author Hetty McKinnon shares her approach to modern, uncomplicated, hearty and healthy food that is powered by vegetables. These classic recipes are the multicultural meals she serves around her own family table. Some are heirloom recipes passed on from her mother, others are old family favourites, and many are variations on much-loved comfort food, repackaged with a healthier outlook. This could be a deconstructed falafel salad of crispy roasted chickpeas and fresh greens, drizzled with lemony tahini; an oozy savoury cobbler of summer tomatoes topped with parmesan-cornmeal scones; or an earthy miso brown butter sauce spiked with crispy sage and tossed through your favourite pasta. Finish things off with a simple dessert of sticky banana golden syrup dumplings, an indulgent choc-orange self-saucing pudding, or an addictive lime pie with anzac biscuit crust - sweet treats that are destined to become new family favourites. These irresistible recipes are interlaced with tender family stories from home cooks around the world.